Welcome to our blog, where we will share useful information about conservation travel and keeping you up to date with all things ACE! The Kruger National Park is a vast wilderness area that was established over 100 years ago, yet this conservation area is still expanding to include private protected areas and National Parks in neighbouring countries…. The African savannah is home to a huge variety of wildlife species. With this much diversity, it’s not surprising that we’ve come up with some equally diverse and interesting words to describe them, and among the most interesting of these are the terms (collective nouns) we use to describe groups of wild animals…. The African Wild Dog is locally extinct in many African countries and is listed as endangered across the entire continent…. 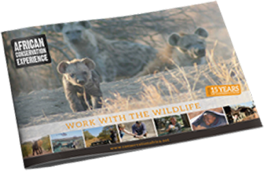 During your time at one of our many projects in Southern Africa you’re likely to be exposed to one or more of the many local languages (South Africa alone has 11 official languages)…. Botswana has recently featured prominently in the international media because of a reported increase in elephant carcasses sighted during the latest aerial wildlife survey….